We will tell about and share our 5-part zine in printed form.. About the year long process commissioned by Le Shadok, a digital maker cultural centre in Strasbourg, and the collaborations we made & those we met. We focused on cabbage. Kimchi, Choucroute (Sauerkraut), and other vegetable ferments, but got our toes and fingers moist with dancing, pH experiments, DIY microscopy, and edible artefacts. 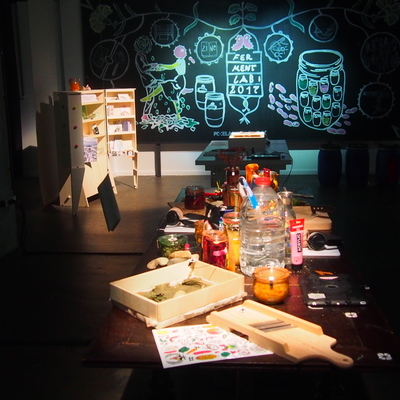 We made an interactive touch-listen table of our tools, jars and leftovers. It is rumoured there is still alot of choucroute still there in barrels.. It is also an occasion to swap and share our and your ferment starters. Bacterial swop-shop! Bring your crocks, krauts, komboucha, kefir, juices and other delicacies. We are bound to start more together! Ferment Lab is an ongoing project of Pixelache Helsinki, and this occasion is hosted by Agnieszka Pokrywka, Andrew Gryf Paterson, and Nathalie Aubret.